There are two schools of thought when it comes to upgrading an engagement ring. The first is “No, never, it’s a sacred thing”, with the other saying “Why not? Where’s the harm? I’m ready to go bigger and better!”. It’s a difficult question to answer, of course, but we think there are many reasons why it is okay to get a different ring. Keep reading to learn how to go about upgrading your ring. Is it Appropriate to Upgrade Your Engagement Ring? Absolutely yes! People change, our tastes change, our lifestyles change, our lives change. Why not an engagement ring? It may well be that, when you bought your original engagement ring, your budget wasn’t anywhere near what it would be today. Alternatively, what seemed beautiful 10 years ago might seem a little dated or even unattractive today. There are many reasons why you might want to change your engagement ring or buy a bigger one, and none of them are because you don’t want to be engaged anymore. Changing your engagement ring is not a reflection on your spouse or your choice to marry him! Unlike a wedding band, which has both emotional and legal attachments, an engagement ring is a sign, a signal of intent to marry without carrying any of the wider formalities of a wedding. As such, the ring is a little less permanent and, therefore, a lot more subject to change if it’s needed or wanted. How to Upgrade an Engagement Ring? Of course, upgrading your ring doesn’t necessarily mean a complete replacement. It might just mean resetting a stone or adding other stones if the current setting allows it. You can add color with sapphires, rubies or emeralds. You can, if the band is still in good condition, add decoration to the shoulders or even some engraving. The fact is that an engagement ring can be upgraded at any time, and in whatever manner you see fit, although asking your partner about it within a few weeks of receiving the original ring might just be a little too early! A good time to bring the subject up might be when finances have changed sufficiently that an upgrade won’t cause any hardship. Any changes at this stage will almost always be aesthetic, not sentimental, so there’s no real point in exposing yourself to struggling to pay for the changes you want. If you have a budget which restricts what you can do, then consider how best to get the most bang for your buck. The center stone will almost certainly be the most expensive part of your engagement ring, so see about building around that. 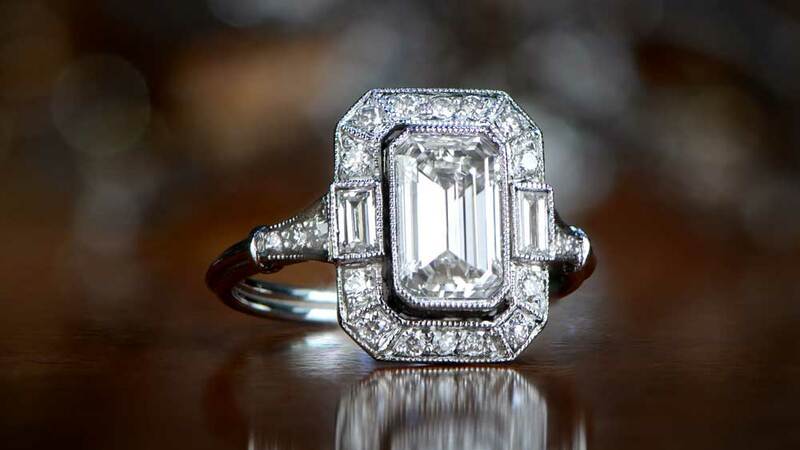 As mentioned before, there are many ways to upgrade your engagement ring. Here are the 3 primary techniques that people employ when upgrading their ring. The first way to upgrade your engagement ring would be to change elements in the original ring that improves its worth. 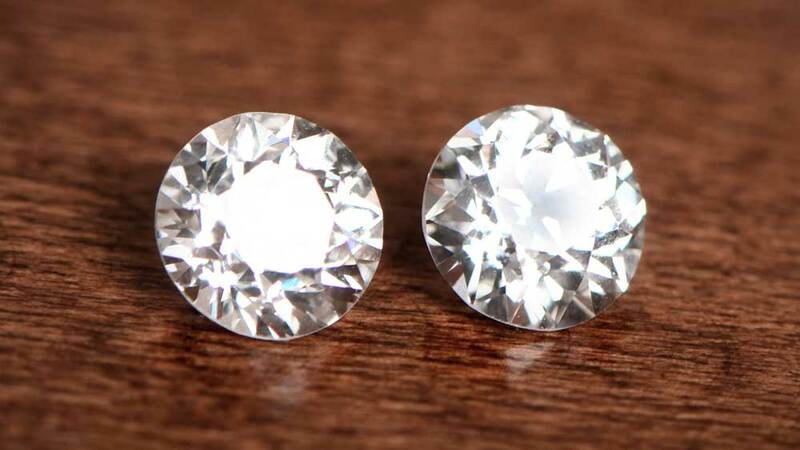 For example, you can switch out the original center stone that was a 1.50-carat, L color, and S1 clarity (price approx $6,000) and replace it with a 1.50-carat, D color, and VVS1 clarity (price approx $25,000). The quality of the “upgraded diamond” is considerably better, but aesthetically the ring will look almost identical. The upgraded diamond doesn’t have to jump up so significantly. Sometimes people will just upgrade a diamond with another diamond that is 1-2 shades whiter. The second way to upgrade your ring would be to change elements in the original ring that improves its worth and its appearance. 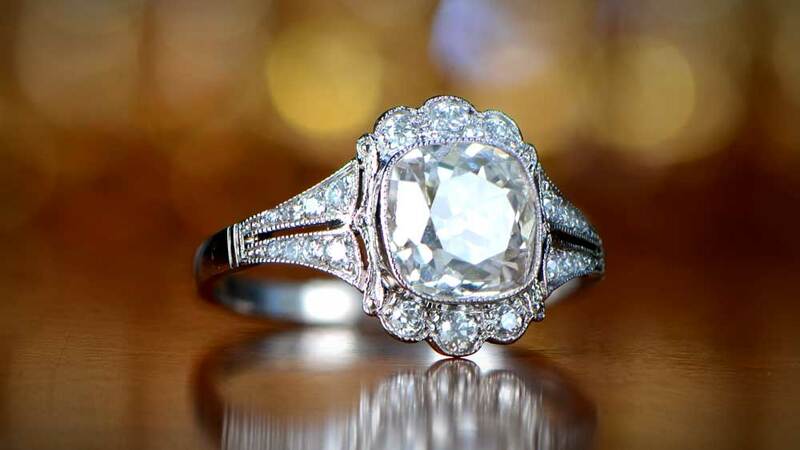 This option involves asking an expert jeweler* to modify the existing engagement ring aesthetically (usually also, but requiring of, adding a center stone of higher value). 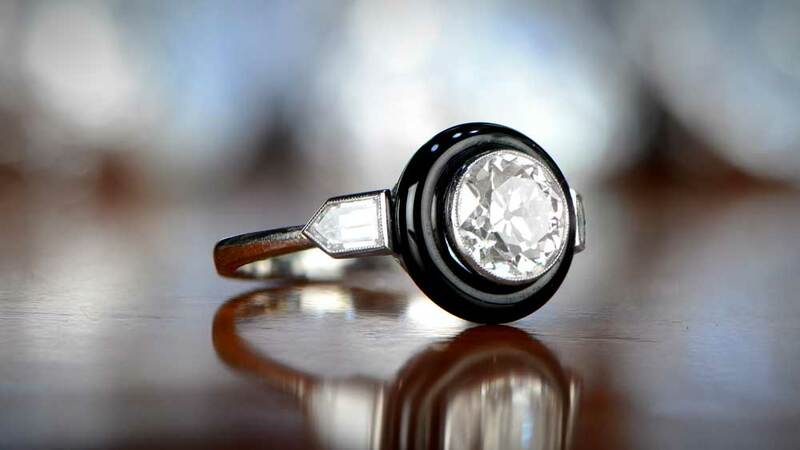 In this example, the couple would add baguette-cut diamonds to the side of the center stone, switch out the original 1.50-carat diamond and put inside a 3-carat diamond, and then add more diamonds along the shank. They may also re-milgrain the edges and toughen up the shank. *Please note, that we strongly recommend only hiring expert jewelers. There is a lot that can go wrong when performing modifications to jewelry. A jewelry who isn’t qualified enough will cause irreparable damage to your ring. 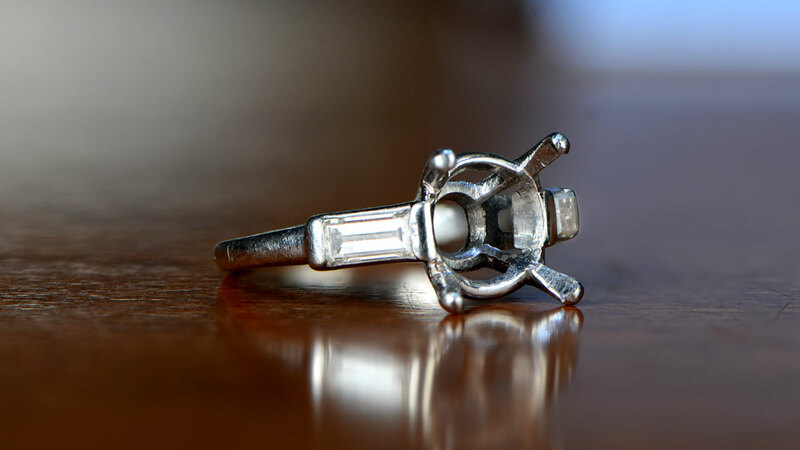 The third way (and the most popular option) is to sell the original ring (or put it aside as a family heirloom) and purchase another ring in addition to the first. This option gives you the most amount of freedom and doesn’t limit any of your options. Many jewelry companies will spare you the bother of selling the ring and will allow you to use the value of the first engagement ring towards to purchase of the second engagement ring. It is important to note that it will be unlikely that you will receive the full value of what you paid. Like all retail objects, the value of the ring decreases significantly once you walk out the front door. See the earlier section to learn more about the different types of upgrades. After deciding which type of upgrade you want, the next step will be to work out your budget. It is really important to commit to a price and only then discover what you’ll be able to get with your funds. 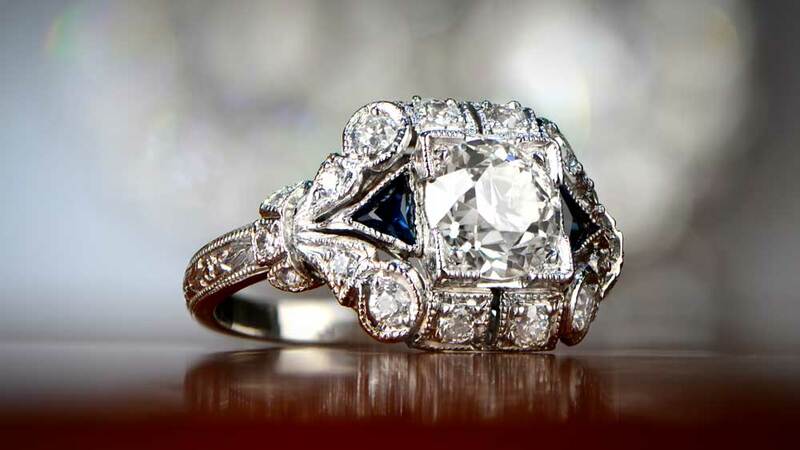 As mentioned, it is critical that only a highly certified jeweler make alterations on an existing ring. 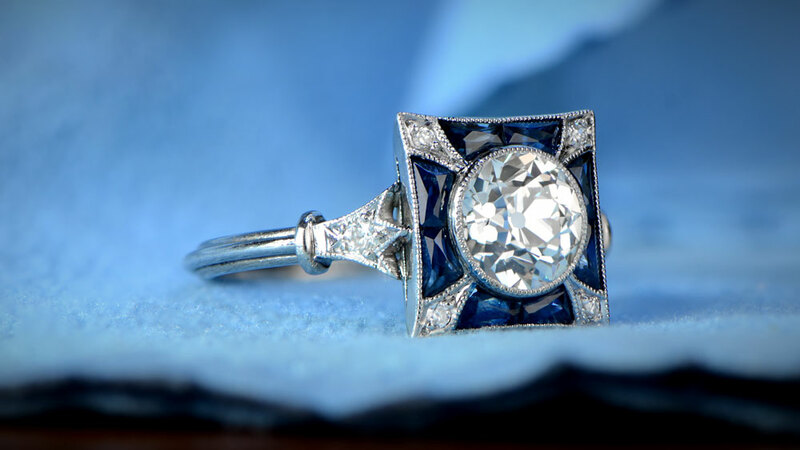 Our jewelers at Estate Diamond Jewelry, are qualified to make advanced customizations on a ring. If you would like to get started, feel free to contact us. Really, using the word “upgrade” is probably a little bit unkind, as it implies the original ring isn’t good enough. That’s probably not the case. It isn’t about spending money just to be seen sporting a huge diamond or waving it about to impress people. It’s about re-modeling what you have, in order to make it more in tune with your personality. If that means the ring makes a statement that is a little bolder than before, then so be it. There are lots to think about when getting engaged and the ring, although important, is just one of them. People buy cars – and even houses – they end up dissatisfied with, so why should engagement rings be any different? The key is that you really don’t want to be doing it too often, so choose your time, and your changes, carefully. Engagement rings are a precious thing, but they’re neither infallible nor immovable. With care, a good ring can become a great one, so don’t be afraid to make the decision to upgrade or remodel. You change over time, why shouldn’t your ring?